Caves of Qud to break it down simply is a HD ASCII Roguelike. It's odd placing the acronyms "HD" and "ASCII" next to each other, but there really isn't a better way to describe the game. it keeps true to it's heritage of Dos based roguelikes, from it's HD ASCII visuals, to it's keyboard command scheme. Even the mechanics and visuals are redesigned versions of what you may find in games like Rogue or Dwarf Fortress. If you've never played an ASCII Roguelike game before, getting into Caves of Qud, could prove challenging. It won't control like modern games, forgoing mouse and gamepad, and sticking strictly to keyboard commands. There is a help menu which I highly recommend any new player to check before proceeding. But once you get over the learning curve, you'll find an expansive randomly generated world to explore, with a ton of replay and experimentation potential. You'll be able to create your own class, and tackle the game's quest and world as you see fit. It's wide, expansive, and deep. Visually it may look unimpressive at first glance, but when you compare it to it's original ASCII version you can clearly see where all the work went into. Instead of actual ASCIIs as representation of the characters and the world, the game uses low-fi sprites that carry a similar visual feel of ASCIIs. Even the font choice and spacing is carefully designed to remind us of older times, while keeping things modern and easily read. There is no sound to speak of, no music, no midis. The game is in early access so it could be something to be added later, however, I suspect the omission is done intentionally, as the original Caves of Qud featured no sounds as well. The game is fantastic, even as a player who've never played a whole lot of ASCII games in the past, but with that said, it's not perfect. Though the lack of sound could of been done deliberately, I'd still prefer if it featured some midi sounds to go with it. Also the initial area is consistent and always the same, with areas outside of the starting point being RNG. This coupled with the high learning curve of Caves of Qud will make the initial few tries at the game feel more tedious than if it was also randomly generated as well. Overall Caves of Qud is what I'd like to consider "The Pillars of Eternity of Roguelikes". 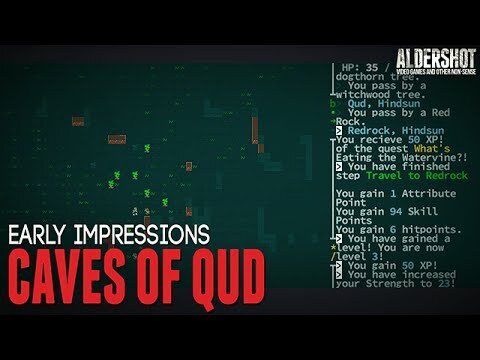 Much like Pillars of Eternity, Caves of Qud keeps manage to update both the gameplay and visuals of it's inspired genre, with out sacrificing the original's spirit, all while being an immensely enjoyable experience.